Collfess, a secret sharing app, is getting popular day by day, exponentially. As most social networking websites and apps, Collfess is attracting audience from the age group 18-25. 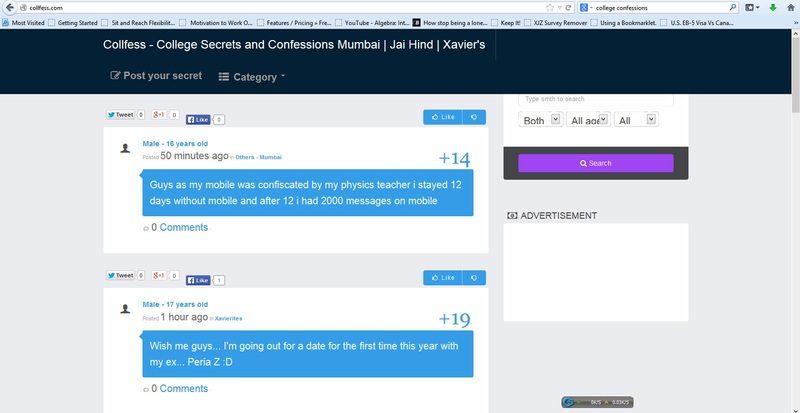 Basically, Collfess allows any one to post confessions and secrets anonymously. People are able to comment on posts using their Google, Twitter or Facebook accounts. But many people ask, why would anyone use this new app over Facebook confession pages? The answer lies in it's extraordinary features. Users can post confessions without an admin judging them. Confessions are approved by the public. Also, it has a strong feature which will delete any offending confession automatically if it receives a certain number of dislikes. Users are also able to tweet, google+, or Facebook like the confession. This site has great potential. Let's see what it brings!